Table 26 is just now up and running, filled with late registering (or re-entering) players…and it’s a tough one. Seated there are the likes of Dan Buzgon ($2 million in tournament earnings), Spencer Champlin (2 WSOP Circuit rings, 1 Borgata title, and $665,000 in tournament earnings), Tom Gleason (7 titles, one from Borgata, and $372,000 in earnings). Eric Hayes, who finished 5th in Event 1 a couple of days ago, earning $41,692, is also on Table 26. Joining this tough lineup is Judi Bielan, who finished 3rd in yesterday’s Seniors NLH event for more than $5,100 (adjusted payout). That pushes her lifetime earnings past $138,000. Play resumed after the break and new tables are firing up quickly. Table 25 is up and running with BorgataPoker.com sponsored pro Katie Stone. Her family celebrated a big score a couple of days ago when hubby Joe Cappuccio finished 2nd in the $500,000 GTD Event 1 FPO Kick-Off event for more than $128,000 (adjusted payout). Katie’s got a couple of her own Borgata Open trophies, one from the 2017 Summer Poker Open Ladies event and another from the 2017 Fall Poker Open DeepStack post-lim. In contrast, seated on Katie’s left is Surinder Kaur, who has just one reported cash, in the February 2018 DeepStacks Challenge $100 NLH event. Thanks to tournament poker being the great equalizer, regardless of experience or bankroll, both of these ladies are starting with the same stack — 40,000. Deepest Stack players are off on a 15 minute break while the green 25 chips are colored up and taken out of play. Cathy Dever is starting the day off right, nearly tripling her starting stack before the first break. She had pocket Jacks on a Q Q Q flop and kept betting and getting called by a player holding pocket 9s for a smaller full house. She’s had some other big hands early today that held up, so she’s off on the right foot. Her one win at Borgata was in the 2016 Winter Poker Open $200 Deep Stack NLH post-lim, good for nearly $42,000. That remains her best live cash but is only a fraction of her more than $423,000 in reported tournament earnings. Three players got to the turn with a board reading and seat 7 bet, got a call from seat 2, then Casey Crews (button) moved all-in. Seat 7 called and the third player opted out. Casey rolled over for two pair to crack his opponent’s . When the finished the board, Casey more than doubled up. He cashed in yesterday’s Veterans Day Charity Deeper Stack NLH event, so he’s playing back-to-back events, looking for another deep run. After Seat 4 opened for 600 and got a call from seat 6, Brownie “BW” Garrett moved in his last ~4,500 from the small blind, and made it clear to the table he had not looked at his cards. Both opponents called to see the flop fall raggedly, . Seat 4 led for 5,000 and seat 6 folded. Seat 4 tabled for the flopped set and we finally got a look at BW’s cards: . He had a whisper of hope with middle pair, but the on the turn left him drawing dead. He headed out, but has the option to re-enter, so I expect we’ll see him again. BW pocketed a cool $5,000 here in September when he Survived in the $500+$60 Super Survivor, one of 28 players out of the field of 290 entrants to be “Super Survivors”. Although yesterday was Veterans Day, many businesses observe the day today, so Borgata will be honoring our nation’s Veterans for a second day. 10% off your bill at The Metropolitan. Sign up for our M life Rewards Military and Veterans Program. Every current military and veteran guest who signs up for an MVP card is automatically upgraded to Pearl, which provides guests with complimentary valet and self-parking, a dedicated buffet line, and other exclusive M life Rewards benefits all year long. Join us again today to celebrate the service of our veterans! Last year the Deepest Stack saw 551 runners over two starting flights, creating a prize pool of nearly $139,000. After the dinner break on Day 2, the final seven players made a chip-based Adjusted Payout agreement. As the chip leader, 1st place went to Stephen Brouillette along with $16,966. Runner-up Bruce Yamron walked with $16,669 and the trophy. This year the guarantee has been increased by 50% to $150,000, so another big turnout is expected, keeping the Temporary Tournament Area busy. First up today in the Temporary Tournament Area is Flight A of the Deepest Stack. Players get 40,000 chips to start and all levels are 30 minutes long. They’ll play 16 levels today, then bag up for the night (about 7:45pm). This is the first of two starting flights — Flight B takes off at 5pm. Late registration and unlimited re-entries are available until the start of level 13 (about 5:45pm). Of course players who miss the deadline for Flight A will still be able to jump into Flight B. They will also play 16 levels before the bag & tag (about 1:45am). This event carries a $150,000 Guarantee on total buy-ins, so it should draw a big crowd. Survivors of both flights will return at 12 noon Tuesday for Day 2. Just a Couple of Weeks Until the 2018 Fall Poker Open! The 2018 Fall Poker Open will begin on Election Day, Tuesday, November 6th, with the first two trophy events. Event 1 (Kick-Off Flight A) and Event 2 (Omaha/Stud High/Low Mix) begin at 11am and 3pm, respectively. Days 2 and 3 will follow at 12 noon Friday and Saturday. John Lytle took 1st place in this event last year, besting a field of 1,618 runners to claim $114,833 in a four-way adjusted payout agreement. The Omaha/Stud High/Low Mix event has become a staple of the Open Series and has locked up the #2 slot on the series schedule since the 2018 Spring Poker Open last April. It was Event 13 during last year’s Fall Open, when Nate Parenti beat out Chris Reslock for the OE H/L title. That’s just the start of the 16-day series, which runs through Thanksgiving Eve. The Almighty Stack headlines the second week with a $300,000 Guarantee. The final week will see a shortened Fall Poker Open Championship with a $1 Million Guarantee. It starts with Flight A on Saturday, one day earlier than usual, and the finale will be live-streamed on Wednesday, November 21st. 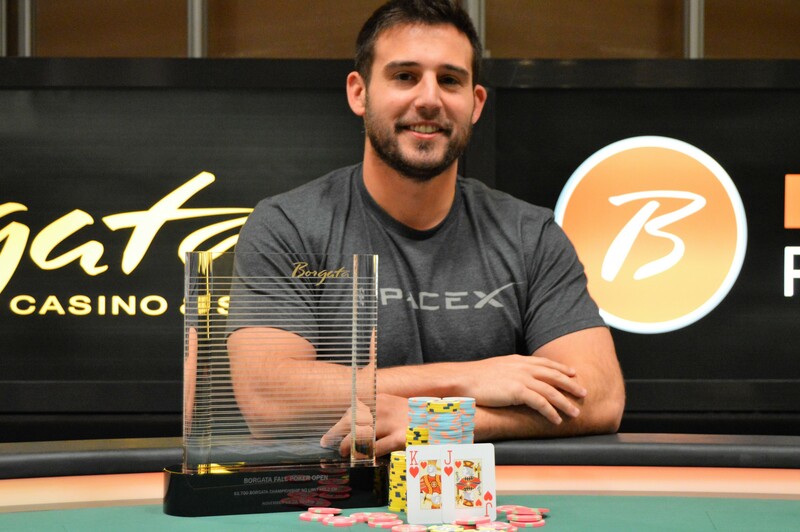 Last year’s FPO Championship title and more than $293,000 was claimed by three-time World Poker Tour Champion Darren Elias, who joined the short-list of players who hold two Borgata Open Series Championship wins. The field of 473 entrants created a prize pool in excess of $1.1 million. Eighteen trophy events will take place during the series with all the best events returning this year. The Black Chip Bounty is in the #3 slot at the end of the first week, a Saturday Series takes place each weekend, and the $1,000 SixMax NLH wraps up the second week of the series. Each of these events carries a $100,000 Guarantee on total buy-ins. The first Sunday of the series, November 11th, will start off with the always-popular Seniors Event at 10am. Since that also happens to be Veterans Day, at 12 noon there is a special Veteran’s Day Charity Event benefiting the Disabled American Veterans, (DAV) Atlantic City Chapter 10. The $200+$30+10 Deeper Stack has a $25,000 Guarantee and the $10 donation goes to the DAV, fulfilling our promises to the men and women who served. The Old School Freeze-Out (no re-entry) event, which debuted during the Borgata Poker Open in September, returns this series as a two-day event. There’s also a HORSE-ament, which hasn’t been held in November since the 2015 FPO. Click here for the full schedule of Main Events. The FPO will take place in the temporary Tournament Area, (TTA) which worked out well as a substitute for the Event Center during September’s Borgata Poker Open. If needed, tables in the Poker Room will also be used. The Fall Poker Open microsite has links to all the info you need for the series, including links to main and secondary event schedules, links to FPO tournament results, and other exclusive offers for tournament participants. Check out the information page and don’t forget to click the link and enter the drawing for a free Championship entry! BorgataPoker.com will be running online qualifiers starting Sunday October 28th. Click here for details. Hope to see you next month for the Fall Poker Open!